A good quality jacket is essential for cycling. This will keep off the rain and keep your clothes dry. However, they have the unfortunate side effect of making you hotter. This is fine in winter, when a little extra warmth is welcome, but in summer it means you get hot and sweaty. On a simplistic level, the more waterproof a jacket is, the less breathable it will be. Choosing a suitable jacket is about the striking the best balance for your ride to work. Windproof: Don’t let the windchill get you! Although this type of jacket is described as windproof, they will also keep you dry in a shower. Plus they have the advantage of being lightweight items and very breathable. These are great if you’re not cycling far or if you are definitely changing your clothes at the other end. Likewise, they are great for summer when all you’re expecting is a few showers. At the other end of the scale you have 100% waterproof jackets which will offer little in terms of breathability. 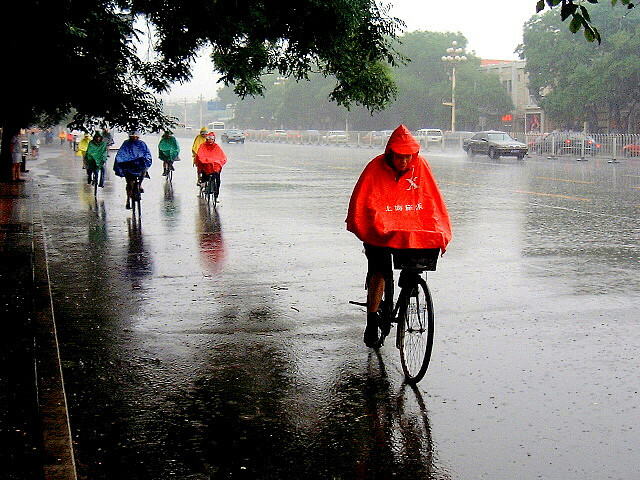 These are for cyclists who wanted to cycle – whatever the weather. A waterproof jacket is great in the middle of a thunderstorm, but this doesn’t happen that often, and they are more bulky to carry around. The bulk of cycling jackets sit somewhere in between these extremes offering a balance between breathability and waterproofing. If you are looking for one jacket for cycling to work, this is the type you should buy. 2. Long back and sleeves – cycling jackets are often cut longer at the back, so that you are covered even when leaning forward. If you’re lucky it might hang down even further and protect your backside as well. 5. Hood – it’s fine to have a hood on your jacket but we don’t recommend you use it when cycling in town. 8. Reflective details – most cycling jackets these days come in a bright colour or with reflective details, to make sure you are seen by other road users. The brighter you are, the safer you are.